As automotive journalists, we're fortunate enough to drive high-performance vehicles in their natural environment. No, not sprinting between stoplights â€” on a racetrack. But we really shouldn't be the only ones with this opportunity. Knowing the limits and how to safely operate potent cars is immeasurably valuable. While some million-dollar supercars come with a free trip to the track for quality instruction, most performance vehicles for the masses don't include that benefit. Recently, FCA announced its Fiat 124 Abarth would include a day at Bonderant Driving School. This offer is unheard of for a $28,000 sports car, and is a great example for other automakers to follow. Now it's Cadillac's turn to invite owners of its V-Series cars to experience elite driver training. The American luxury automaker has announced that 2017 ATS-V Sedan, ATS-V Coupe, and CTS-V sedan buyers will earn a free ticket to Cadillac's V-Performance Academy at Spring Mountain Motor Resort and Country Club near Las Vegas, Nevada. This two-day course will be available for online registration after owners take deliver of their cars. "Cadillac is a brand for passionate people, by passionate people," said Nathan Tan, associate director of Brand Partnerships and Experiences for Cadillac. "V-Series customers are in many ways nearest the core of the Cadillac brand, and we are proud to offer this valuable training with our thrilling products." Should owners prefer, Cadillac will also offer a single-day V-Performance Lab, which travels to different racetracks around the country. In 2016, the V-Performance Labs will be held at Lime Rock Park in Lakeville, Connecticut, and Circuit of the Americas in Austin, Texas. "The V-Series are the most-track capable Cadillac models ever, using exclusive technologies tuned by a select group of dedicated engineers," said Brandon Vivian, Cadillac executive chief engineer. 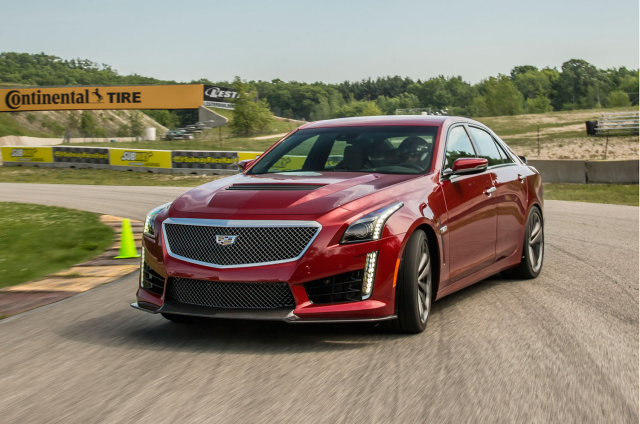 "These technologies, such as Magnetic Ride Control, Performance Traction Management software and the Performance Data Recorder, set the Cadillac ATS-V and Cadillac CTS-V apart from all other luxury cars and are the tools drivers will experience at the V-Performance Academy." While this might snub 2016 ATS-V and CTS-V buyers a bit, Cadillac will offer its V-Performance Academy training as a standalone purchase for owners who "went V" before V was cool.